At first glance it seems flippant to assume that one person can have such an impact on the precious metals industry. However, when it comes to the new administration of President Trump in the United States, there are a lot of decisions that could be made domestically that will have a tremendous impact on the global marketplace for precious metals. We’ve discussed in past blogs the volatility that can grip precious metal prices, and how the uncertainty of a Trump Administration can impact gold and silver. Now though, we are beyond some of the initial speculation of “If President Trump” or “When President Trump.” The nation’s 45th president is in office and making real decisions rather than promoting ideals on the campaign trail. What are some of the real-world consequences for precious metals of his administration? In the final week leading up to President Trump’s inauguration, he repeated many of the same calls and warnings that he had throughout the 2016 Presidential Campaign. President Trump again expressed his distaste for the “obsolete” North American Treaty Organization (NATO) and criticized Angela Merkel of Germany for accepting “all of these illegals” into the country. His words had the power to shake the markets and send shutters of concern through investors. Even though gold prices typically get a bump in January of each year, his words leading up to inauguration day intensified the demand for safe-haven metals. Gold for immediate delivery on Tuesday, January 17th rose .9% to $1,212.90 per ounce. That marked its highest point since November 2016. At the same time, Comex silver was up $.38 per ounce to $17.15, while palladium had shot up 10.5% to start the new year. Palladium has shown particular strength in the last few years because of its positive industrial production, with 20% growth on an annualized basis in 2016. That’s greater performance than both gold and silver. To be sure, President Trump’s words alone aren’t the only factor impacting gold and silver’s rise in early 2017. The US Dollar staged a strong rally in value to end 2016, which has a weakening effect on the price of gold and silver the vast majority of the time. More than President Trump’s words, his actions could prove to have a greater impact on the precious metals marketplace. The rally experienced on the Dow Jones, Nasdaq, and S&P 500 throughout late November, December, and early January has ebbed and flowed more regularly now as the new administration has taken over. On the trail Trump promised a lot things to the American worker, such as protection for their jobs, and end to NAFTA, and canceling any possible implementation of TPP. The message was simple: focus on America and American jobs. However, words have a short-term impact on precious metals. When President Trump verbally proposes any certain action or provides vague details, it sends a wave of uncertainty through markets. You need look no further than the massive devaluation of the Mexican Peso in the weeks and months since the election. So far, President Trump appears intent upon following through on as many of his campaign promises as possible. In the past week, he’s ordered a federal hiring freeze in the United States (US Military exempted) and withdrawn the United States from participation in the Trans-Pacific Partnership (TPP). These are just some of the executive orders he’s signed in his first week in office, but it sets the stage for precious metals and the global economy as a whole. The Trump Administration’s federal hiring freeze, for example, calls into question how and where the federal government will allocate and spend money. Will the nation invest in infrastructure with those saved funds? This action alone creates a sense of uncertainty that will further push investors toward safe-haven metals. When the federal government spends less, the trickle-down impact on contractors around the country (construction, heavy machinery, etc.) means a slower marketplace at times. Slower markets generally mean rising precious metals. Additionally, the withdrawal from consideration of US participation in TPP (Congress hadn’t approved TPP yet anyway, making Trump’s order a formality at the moment) strikes a chord among some global investors of US isolationism. Combined with his similar views on NAFTA, President Trump’s action on TPP can also sow worry among investors. Perhaps the most entertaining aspect of the Trump Administration’s transition has been the verbal sparring back and forth between President Trump and Chairwoman of the Federal Reserve, Janet Yellen. In remarks made on January 18th, then-President-Elect Trump lamented the strength of the US Dollar, suggesting that because other foreign currencies are purposely undervalued (China), the US Dollar is by default overvalued. His comments immediately hit the value of the dollar, sending it down 1.2%. Yellen hit back on inauguration day by suggesting the Federal Reserve would consider multiple interest rate hikes “a few times a year” over the course of the next few years. Yellen’s comments that day sent the dollar upward and gold downward, inflicting its largest one-day loss of the year to date. 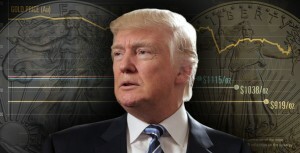 In the end, most investors and market watchers expect volatility to reign supreme in the weeks to come as President Trump’s specific actions remain murky. In the short-term, most expect to see gold and silver prices trend higher as long as the president continues to consider policy directions. The specific actions he takes in the future, if initial executive orders are any indication, could strengthen gold and silver in 2017. This posting from JM Bullion is based upon analysis of gold and silver prices to date in 2017 in reaction to domestic and international political events. President Trump’s actions are not being analyzed on merit, but rather, viewed through the lens of their impact on global marketplaces and precious metal prices. None of the information or commentary contained above is a replacement for sound financial and investing advice from a Certified Financial Advisor or Planner.